We adore the luminous metallic lace and great fitted cut of this little dress. The Alythea Metallic Lace Overlay Fitted Dress is fully lined and has metallic lace on top. It features a rounded semi-sheer lace neckline and simple fitted cut—Pictures don’t do this dress justice! This is a great party dress you can pair with strappy metallic heels or pumps and a clutch. You’ll get so many compliments on this one. Details: Lined except at neckline. Invisible back zipper. 100% rayon. Lining: 100% polyester. Hand wash cold water separately. Color will bleed. No bleach. Hang to dry. Small measurements: Length from top of shoulder to hemline: 33”. Bust: 32-34”. 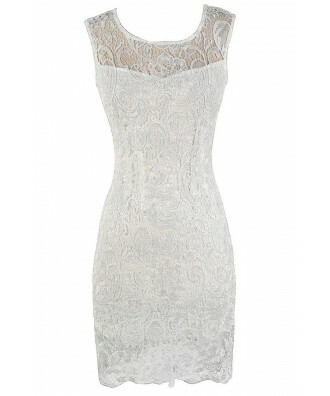 You have added Alythea Metallic Lace Overlay Fitted Dress in Ivory into Wishlist. 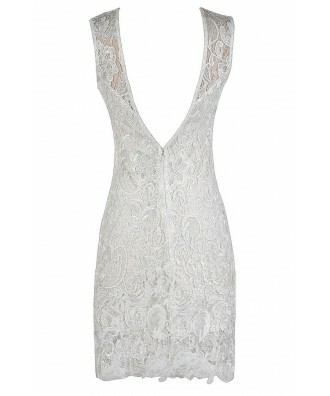 You have added Alythea Metallic Lace Overlay Fitted Dress in Ivory for Stock Notification. 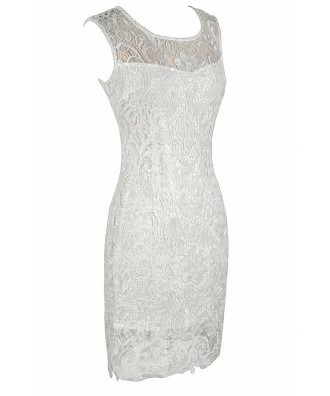 You have set Alythea Metallic Lace Overlay Fitted Dress in Ivory as a loved product. You have removed Alythea Metallic Lace Overlay Fitted Dress in Ivory as a loved product.